Death from an invisible cloud will come to Gardendale sooner or later. Live in terror, Gardendale, just like these folks in West Odessa who now fear for their lives! 2) Meetings will be in a location designated by the surface owner. A local restaurant, meeting room or a third party’s home will make it as comfortable as possible for you and our members. We will provide refreshments. Feel free to offer your own suggested meeting sites for us to take into consideration. We want to work with you to make the meetings civil and productive. 3) The meeting may be recorded by either party. In the past we believe your land company has misspoken or we may have simply misunderstood what was being said. All parties will benefit from accurate information. 4) If you wish we will make arrangements for power, tables and a projection screen for AV equipment. Please make this request in your letters as specified in number 1). 5) Please bring enough copies of documents for the members in attendance to review. Ten copies should be sufficient. If you wish, send the documents a few days early via mail and we will copy them for distribution at the meeting. 6) These meetings are not an attempt to legally represent the surface owner you need to communicate with. Their purpose is to provide a neutral setting for both parties along with emotional support for our member. Respectfully, Dan Boggs, President, Gardendale Accountability Project, Inc.
Meet Hector. He lives with his family and elderly mother in Gardendale, TX. Gray Surface Specialties who represent Berry Petroleum (BRY) has staked his 6 acres of land for an oil and gas well. 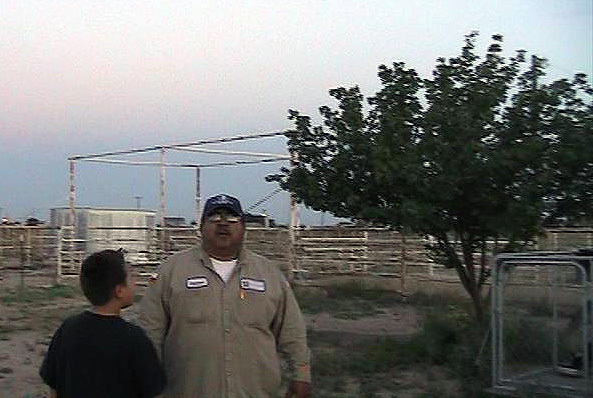 Gray explained that the tree and dog pen 15 feet from Hector’s home will be removed for the caliche drilling pad. Hector also cares for his elderly mother who suffers from a congestive heart condition. She lives next to him. Care for aging parents is deeply rooted in Latino culture, and Hector is bound to protect his mother. While away at work, Gray’s minions came to Hector’s home and harassed his mother, upsetting her greatly. 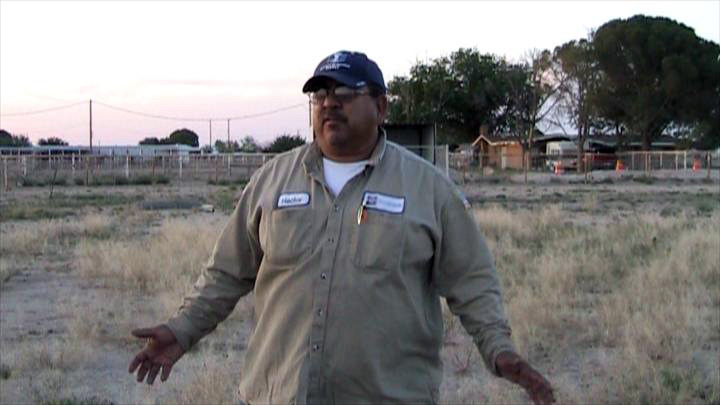 Hector has plans to build his dream home in the very spot Berry Petroleum has staked for a well. 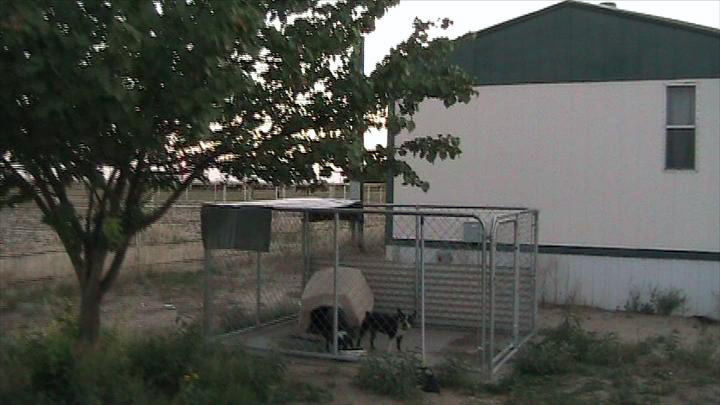 Gray promised Hector that if he started building his home, they would tear it down! Unfortunately, Hector’s story is being repeated all over Gardendale. The bully tactics of Gray and Berry echo throughout this community. Stay tuned to this page and www.gardap.org for Hector’s compelling story coming soon in the next “BERRY TALE”. If you’ve been treated this way by Gray Surface Specialties or other Berry Petroleum representatives, and you have the courage to stand up, please contact GARDAP.ORG and we will assist. If you haven’t been treated this way, count yourself lucky, then get in the fight to help those less fortunate…because you could be next! While it may seem that the issue facing the residents of Gardendale is not within your ‘bailiwick’ I think it is. You see, Governor Perry, you will be facing issues in the near future that have to do with oil and gas development on a state level. The Keystone pipeline may be one of these. How you support issues like Keystone will affect the citizens you represent. We understand that the Republican party is pushing the pipeline for the jobs it will bring. However, were you aware that building a pipeline will involve the use of imminent domain to seize a huge amount of land necessary to build it? A group of private companies building a private pipeline for private profit will seize private land owned by private American citizens! And they will do it with the blessing of the U.S. Government. At the Gardendale Accountability Project we empathize with those land owners that will be bulldozed by Keystone. We are experiencing the same thing at the hands of Berry Petroleum of Denver, Colorado (a foreign corporation doing business in Texas) The injustice we have suffered at the hands of Berry Petroleum is worse than the profligate use of imminent domain that many in Texas rail at and indeed, passed legislation to limit!. All Berry needs to seize our land for their private use is a contract with the mineral owner, a fee paid to the Texas Railroad Commission and they are free to do almost as they wish on our private property. Our permission is not necessary for them to do anything they deem ‘reasonable’. If a surface owner of modest means disagrees with an oil company’s definition of ‘reasonable’ then they have the special joy of pitting themselves in a legal battle with a multibillion dollar company having the ability to hire legions of lawyers. A young family making $50,000 a year and owning a couple of acres that Berry wants to drill on doesn’t stand a chance. Oil companies don’t hesitate to sue folks into oblivion. Did you know that a tactic used by oil companies is to countersue for ‘lost production’? This amounts to about $100,000 per day if the surface owner balks at what they want to do. Governor Perry, this practice is an outrage and has the effect of crushing any opposition to the oil company’s definition of reasonable. In Gardendale Berry Petroleum thinks it ‘reasonable’ to drill 150 feet behind the home of a 70 year old widow with a heart condition. She has lived in Gardendale for 40 years. When she raised her voice the original lease owner (Keystone Petroleum, by the way!) rushed to get an injunction against her. Governor Perry, she is on oxygen and uses a walker! Shame is not a word in many of these oil companies dictionaries. It doesn’t bother them to ‘run on’ the poor, widows and elderly. Would you want them to do that to your mother? The lease was subsequently sold to Berry Petroleum. Additionally, Berry Petroleum thinks it reasonable to drill 300 to 600 wells in our neighborhood. I could go on and on but eventually you would become numb to our complaints. A question to be answered is this, “ If state officials can come up with a plan to ‘protect the lizard’ and get oil companies to sign onto it why can’t they do the same for us?” I borrow a phrase from our Lord “Are we not worth many lizards?” In summary, what is going on in Gardendale affects your constituency and I intend to continue sending you updates to the ravaging we are enduring. You may review a chronicle of our plight by going to www.gardap.org and checking out our Facebook page, “The Gardendale Accountability Project.” We are unreasonably being taken advantage and want you, as our elected governor, to come to our aid. Dan Boggs, President, Gardendale Accountability Project, Inc. The attached pic was taken the week of May 7th. Location is on the north side of Cottonwood Rd – between Western Ave and 1788 (closer to 1788) – Gardendale, TX 79758. I will try to make a long story short. On my way to work, I was behind a tank truck which came off a lease road south of Cottonwood, going north on Cottonwood with water coming out of the back of the truck from all valves. He slowed down on the side of the road with water still coming out and after I passed by, I pulled over to take the picture. The driver turned left on to the lease road and continued on – the water continued to come out of the open valves on the back on this truck. Location is easy to verify by the sign (Fasken) and the pipeline on the north side of the road. Maybe it was just fresh water? Maybe the tank had never been used for anything but fresh water? What are the odds? Maybe it wasn’t just water – maybe that is why it’s illegal! Maybe these operators don’t follow the rules anywhere they drill. Please help us if you can! We just want to keep our community a safe place. On the evening of May 9th, 2012, Berry Petroleum released an unknown noxious gas upon several nearby homes which include young children in Gardendale, TX. Residents complained of headaches, sore throats, and burning eyes. The TCEQ was notified as well as the Texas Railroad Commission. Both agencies sent field inspectors to the site and Berry Petroleum representatives came as well. After much discussion between these men, the gas emission was INCREASED! Note in the video the volume of visible gas being released; the unanswered questions are 1) what kind of gas is it that would cause such negative health effects, 2) why is this gas being allowed to escape onto people’s homes, and 3) what does the “EQ” stand for in TCEQ? Does anybody know? Here’s a perfect example of how Berry Petroleum and BTI Services are being a “good” (insert sarcasm here) neighbor in Gardendale, TX . 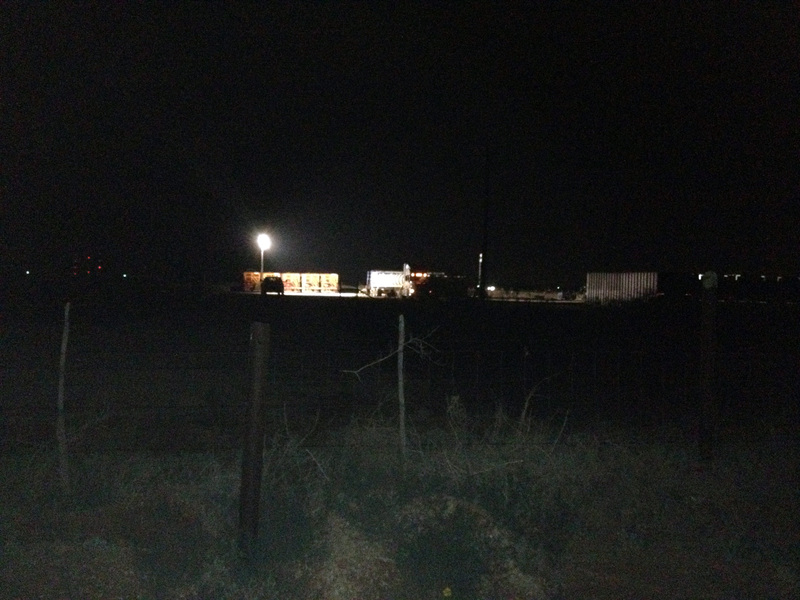 On Monday night around 9:30pm while entering his property, this landowner stopped to take a look at this fracking location. 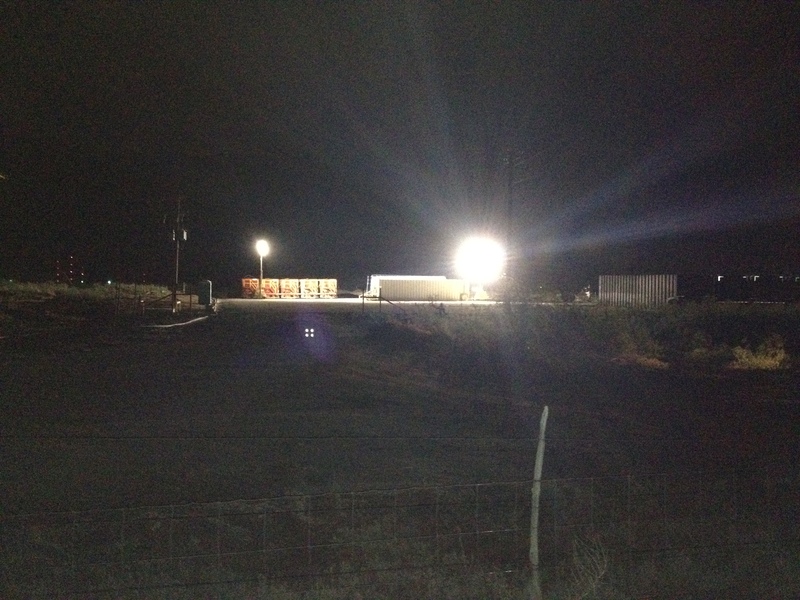 He took a picture, and immediately, the pickup truck shown under the light on the left charged to the fence. A BTI employee got out of the truck, came right up to the fence line, and in a gruff voice exclaimed, “Is there something I can help you with?” The landowner answered that the noise from the generators were disturbing the peace of the neighborhood, but the employee was unresponsive. Not long after the encounter, the BTI employee in a seemingly blatant act of nuisance and malice, turned an additional 4-light array on the landowner’s home! 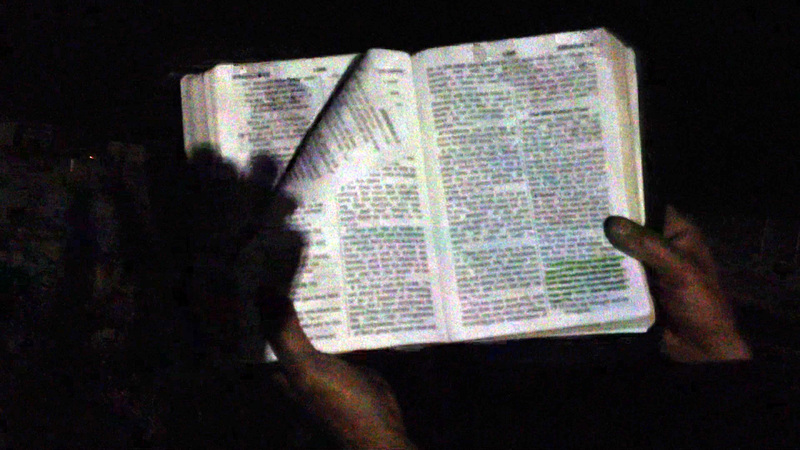 As you can see in the picture, the light was bright enough to read by 300 ft away. This is typical behavior by oil and gas operators in the Gardendale community. GARDAP will continue to “illuminate” the truth when these egregious acts are committed on the residents of Gardendale. 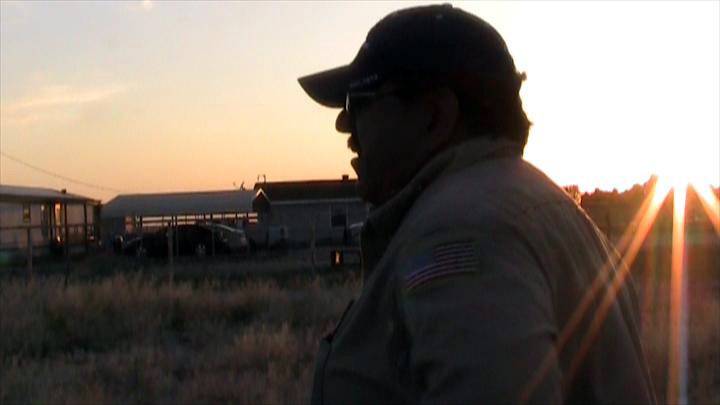 Berry Petroleum either cannot, or will not, control their negative impact on this community. Berry’s apologist firm KGB Texas can continue to “say” that Berry is doing good, but the residents of Gardendale “see” the truth.